When it comes to business meetings and events, it just doesn’t get any bigger than the technology conference. As some of the longest-running shows in the event industry, these super events occupy the largest footprints, attract the most number of attendees, have the deepest budgets and deliver the largest ROI. As technology changes, however, with new apps, platforms, big data and the cloud, and a new set of expectations by up-and-coming attendee populations challenges the status quo, tech conferences have evolved, too. No longer confined to classroom settings, kiosk-based product demos and one-way conversations with talking heads, tech conferences have undergone an extreme experiential makeover. We spent the past few months talking with the brands behind some of the world’s largest flagship tech conferences—Cisco Live, Dell World, the Intel Developer Forum and Microsoft’s Worldwide Partner Conference. We even toured Oracle OpenWorld in San Francisco with the company’s event crew. Here’s a closer look at what we learned, and what the biggest of the bunch are up to now. 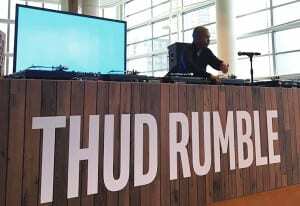 The 2015 Intel Developer Forum featured consumer-style experiences including dj sets. Intel invited industry innovators—from the data center, the cloud, the maker community, wearables and fashion and gamers—to speak about the applications and experiences they are developing. The idea? “To showcase Intel as a more sensible, human and authentic brand with a variety of experiences across Moscone,” Torregroza says. And still, Intel accomplished this while increasing the technical content, something its attendees look for, and expect, in the sessions (Agencies: Jack Morton Worldwide, New York City; The Taylor Group, Toronto). Dell World volunteers staffed the welcome desk and help center, offering attendees help right then and there. “It introduced a very human-oriented conference, which I think is important at a tech event,” says Jeanne Trogan, executive director-global events marketing at Dell. Do-good charitable activities can also add a human touch. Oracle OpenWorld sponsored a JavaOne4Kids day before the conference opened that exposed kids to programming, robotics and engineering in hands-on workshops. The company worked with local schools to include disadvantaged children as well, as a way to give back to the community. Cisco Live sponsored a Stop Hunger Now activity in which participants donated 30 minutes of their time to assemble packaged meals for the hungry. This year they put together more than 100,000 of them, and matched each attendee tweet to Mike Rowe’s charitable work foundation with a donation. Oracle OpenWorld 2015 featured festival-style consumer engagements including an adult ball pit meant to physically simulate being in a cloud. Although traditional classroom-style sessions remained on the agenda, Dell World sessions often introduced discussion formats such as panels, white-board sessions and workshop environments. Cisco Live likewise incorporated walk-in labs, where people solved problems together on laptops, and made engineers available in a Solutions Clinic. 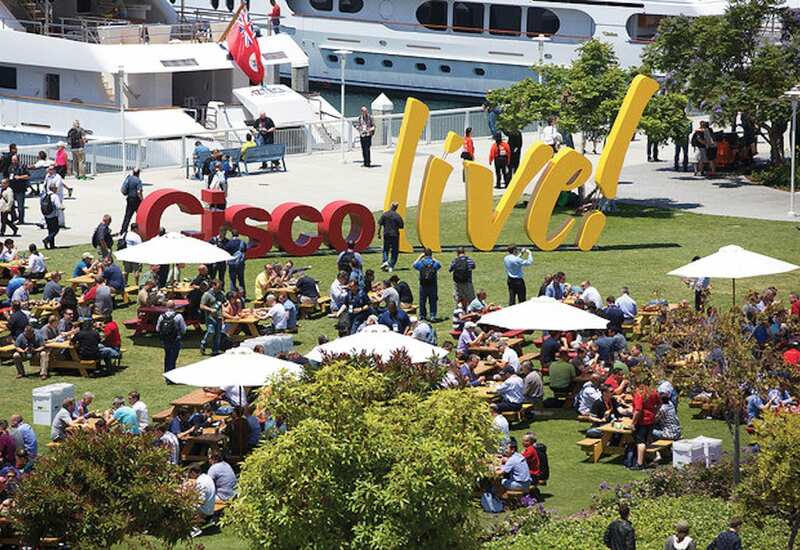 “It was more about engaging in conversation and interactive experiences versus sitting and being presented to,” says Kathy Doyle, director, global customer conferences, Cisco Live & Cisco Connect. IDF attendees could kick back in the Experience Pad, an experiential retail area where they could network and try out the latest tablets, gaming systems, accessories and Intel wearables while robots powered by Intel technology delivered water and snacks. “It was a nice departure, an evolution of the networking lounge from Intel, with experiential retail and social interaction with product and devices,” Torregroza says. Another example: the Centers for Immersion Experiences at Microsoft’s Worldwide Partner Conference, where attendees spent 90-minute sessions with instructors in sales simulations rather than sit in on lectures about it. Dell World’s open footprint featured fun, photo op-worthy engagements. Modern technology conferences leverage creative experiences to bring their messages and technology to life in ways much like those at a music festival or pop-up events. 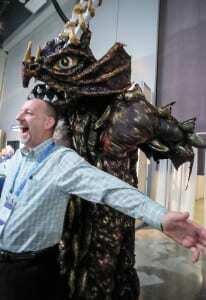 Intel personified its sensory technology with robots, BMX sensor bikes, culinary demos, dancing robo-spiders and more. “As a society, we love music, sports, fitness, food, entertainment, gaming. We brought all of those passion points forward on various levels of Moscone West to engage people, and there was a technology spin to it that helps Intel connect through these experiences,” Torregroza says. Intel RealSense technology digitally scanned attendees to create 3D laser-etched selfies of their heads embedded in crystals. “It was a little risk-taking, but people lined up for it,” says Torregroza. The experience was such a hit that Intel may implement it at other shows. 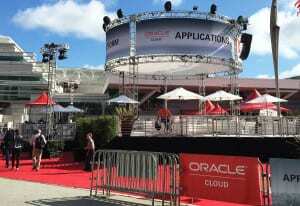 At Oracle OpenWorld, a b-to-c engagement brought the ethereal concept of the cloud, which was the theme of the conference, down to earth in a museum-like installation that had attendees bouncing among the 125,000 balls that filled its floor. A Voice of Data experience transposed people’s statements into etchings on leather bracelets, and four pop-up moments took place over the course of the conference to surprise and delight attendees. “We offered some experiences that enhanced the attendees’ opportunities to have fun, but also reflect the attributes of the brand,” says Francisco Delgadillo, vp-brand creative at Oracle (Agency: Mosaic, Chicago; Invisible Light, Brooklyn, NY; Snarkitecture, New York City). Microsoft also incorporated consumer-type activations into its customer area where attendees could sit in a NASCAR vehicle, try some tasty Godiva chocolates or have a t-shirt made. A Twitter vending machine awarded prizes for tweets. 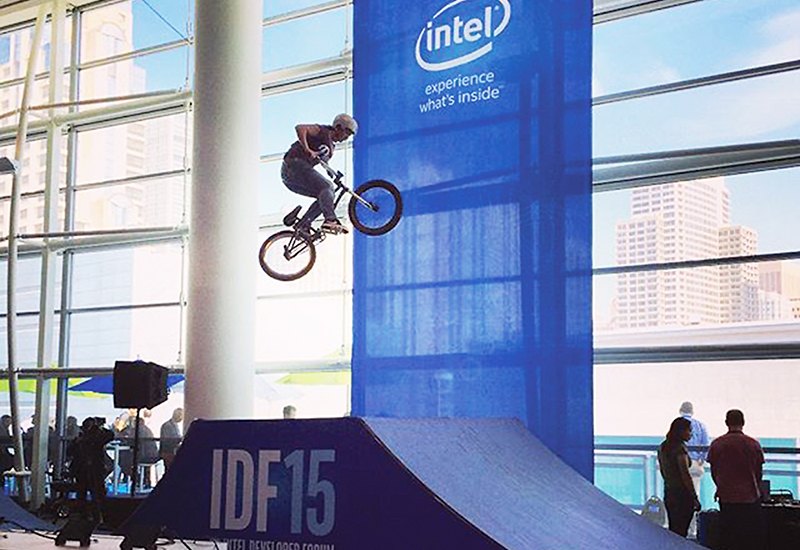 The 2015 Intel Developer Forum featured BMX sensor bike stunts to connect attendees’ passion points to its technologies. Just as social media and technology have fostered more casual forms of communication, the physical environment of the tech conference reflects that trend as well. Microsoft’s Worldwide Partner Conference has become less formal and a lot more energetic, says Kati Quigley, senior director- partner marketing at Microsoft. Along with that, the conference’s traditional, defined structure has given way to a more open experience. “This year, almost everything was all in one place, intermingled together,” Quigley says. “We had a commons area with community areas for women in tech, small- and medium-sized business partners, lounges, places to charge devices and grab a coffee and have a conversation.” And the nice thing about it: people stuck around and talked to each other, she says. Oracle OpenWorld is organized like a campus environment with a central Oracle Cloud Plaza surrounded by 18 “business schools,” so the conference is easy to navigate and attendees have their own specialized areas for sessions, demos, receptions, keynotes and networking. Cisco Live calls its central area The Hub, a veritable hive of activity buzzing with one-on-one meetings with Cisco experts and executives, hands-on labs, a social clinic and networking. Dell World opened its three separate areas for exhibits, meals and general sessions into one large space that had a bazaar, or market, type of feel. “We wanted to make it fun so people relaxed, interacted and connected with each other,” Trogan says. It was also a place for photo ops and conversations on topics like the cloud, the Internet of Things or big data, all with an authentic Austin feel. 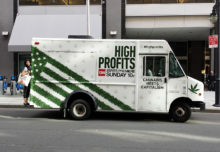 Local bands played during breakfast and lunch breaks, and food trucks replaced the typical convention fare. A local microbrewery’s wall of beer cans served as a backdrop for photo ops in this area (Agency: Sparks, Philadelphia). 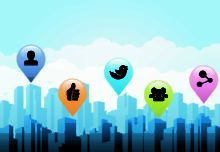 As their conferences grow in size, tech companies are creating smaller communities within the broader group. Cisco offers special programs for young professionals, women in IT, social media influencers and college students. Dell, likewise, launched a customer loyalty program for those who have attended all four years of the conference. 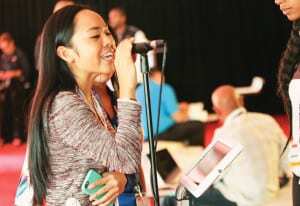 Members of this group had their own lounge in the convention center, a special meet-and-greet with company founder Michael Dell and a VIP area for the opening concert with John Mayer, among other perks. OpenWorld’s Voice of Data experience earned participants a customized bracelet. Personalization takes the conference experience to a whole new level. Tech companies are mining attendee data and devising programs and offers based on their actions and interests. “To do this requires a good engine to understand the data, then come up with the programs,” says Cisco’s Doyle, but, who better to command that experience than a tech company. Oracle creates customer personas within its audience and denotes them within each venue with icons and colors for a consistent brand identity that continues beyond the conference. “We’re trying to be much more segmented, much more targeted to what individual customers and companies need and are looking for from a content and conference experience,” says Paul Salinger, vp-marketing at Oracle. Shifts in consumer behavior and the growth of social and mobile platforms have resulted in an always on, always available world. “And we are designing Oracle OpenWorld to reflect that,” says Salinger. He sees the conference as part of the customer journey, or a “way point,” according to Steve D’Alençon, senior director-global advertising at Oracle. D’Alençon’s team captures long and short form video at the conference and throughout the year creates white papers, infographics, blogs and case studies that it delivers through digital channels. “Our focus is really to evolve beyond the standalone event to have a 365/7 interaction with customers, prospects, partners and, to some extent, employees,” he says. Intel’s ceo Brian Krzanich did a periscope interview at IDF, part of an effort by the social media team to extend the physical experience to the social community. Experiential, indeed. 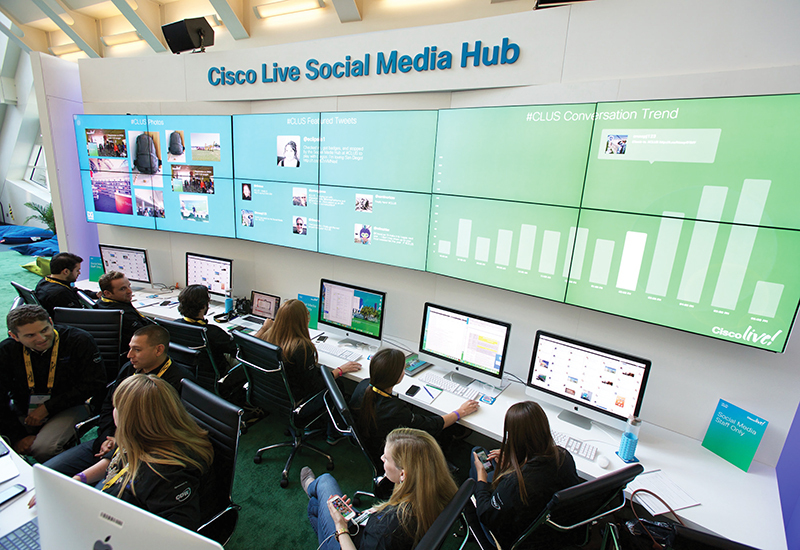 To keep the energy high at Cisco Live, the brand creates centralized ‘hubs’ where attendees congregate and connect with experts and one another.